The Gettysburg Address was given on November 19, 1863 155. 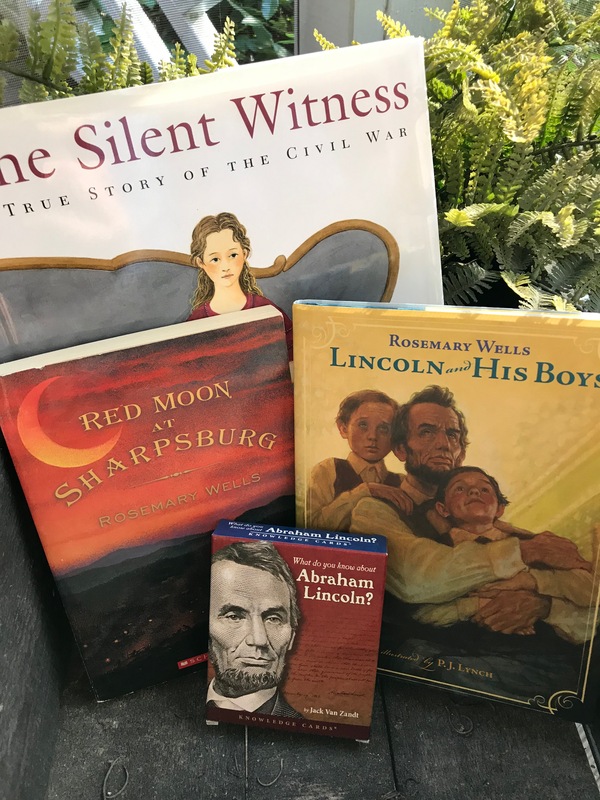 That was 155 years ago and when I heard that news on the radio this morning I decided to share some Civil War teaching resources with you. 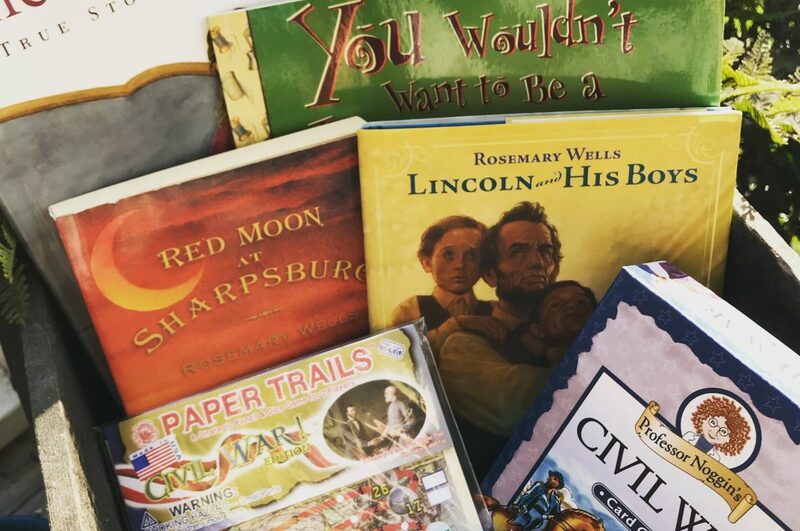 I have this part of my library organized by time line so that I have what I need when any subject comes up in our homeschool and to share with friends quickly and easily. We spent a whole year studying the Civil War when my girls were little. They still say things like, “Do you remember when we….” and then go off talking about a trip we took or a book we read. We have so many good memories from that year. Let’s start with the books we loved. Do you know the story of Wilmer McLean and his family? I won’t ruin it by telling everything, but I will say a little to draw you into the story. Wilmer Mclean saw the beginning of the Civil War when troops arrived and fought on his front lawn in July of 1861. He decided to move his family to get away from the war and settled in a tiny village called Appomattox Court House. It is a fascinating story and a great way to start teaching the Civil War, no matter how old your students are. I plan to read this book out loud to my high school class when we get to the Civil War. This is probably my favorite book that I have ever read aloud to my children. I love this story and I love this author. A girl named India is the protagonist of this story, but she is tough as nails and she made the struggle of surviving at home during war real. There are plenty of battles and compelling male characters for boys to love this story too. I think I love it so much because I had been reading aloud and weeping over books and my girls would just roll their eyes and say, “there she goes again.” But this book was so real and so touching that they not only cried with me, my oldest ran out of the living room and up the stairs because the Union soldiers were about to burn a beloved library. 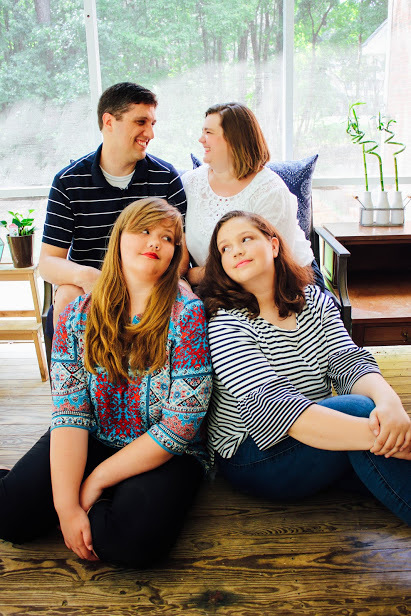 With just two of us left we rested for a moment and dried our eyes and when I was ready to read again I saw my oldest daughter’s sweet red face at the banister. She stayed upstairs for the rest of that day’s reading so that she would not be burned by the flames. It was one of those moments when I realized that I was doing something good by continuing to read day after day even when it did not seem to be sinking in. I include this one because it shows a side of Lincoln that we do not often see. It is a very quick read aloud or independent read and the pictures are so beautiful! The illustrations read like a page of the story and I like to go through before I read and have students tell me the story that the picture is telling. It is so good for them to practice picking up the feel and the emotion of a painting noticing the little things like what time of day it is, what do you see out the window or in the mirror or other art in the room. This is a great resource for those questions that allow you to teach art and history at the same time. You Wouldn’t Want to Be Nurse During the American Civil War! The tag line of this book says it all, “A Job Not For the Squeamish.” This is a series of books and we have many of them. My oldest loved these books because they tell the gruesomest details in the funniest comic book way. That balance of truth and humor is hard to find and these books seem to get it just right. You Wouldn’t Want To Be a Civil War Soldier! These cards use real photography from the era which is a fascinating subject to study on its own. 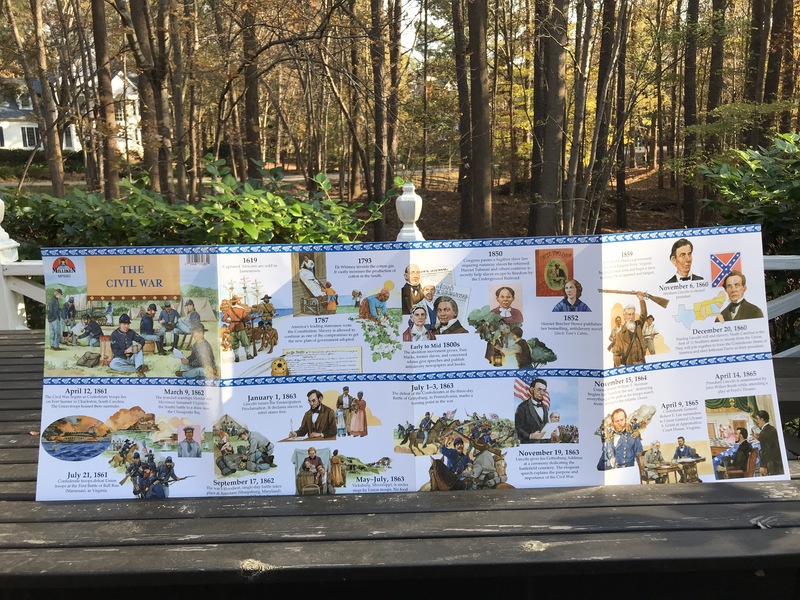 Each card is dated so that you can use them as a visual timeline of the war. It comes with 4 different ways to use them to play a game. I kept these because of all the ways we can use them. This one pack of cards does many many things. Even playing a quick game of trivia over lunch is worth it to me when I don’t have to create the questions. This is another fun set of cards that gives you information in small bite size pieces. This is a great set of cards to have in the car for a quick learning minute. I love to use things like this when we are on road trips. We read a card between videos which usually leads to reading one more and then one more and before you know it we have read all the cards. Here is another resource that has many versions for many time periods and we have played most of them as we have studied. This is a great game for “olders” and “youngers” to play together, because each card is illustrated and there is a hard and an easy option. Plus there are options within those categories so it is is not a play it once and you are done game. You can play this over and over and get different questions each time. I plan to crack this one out with my high school class. 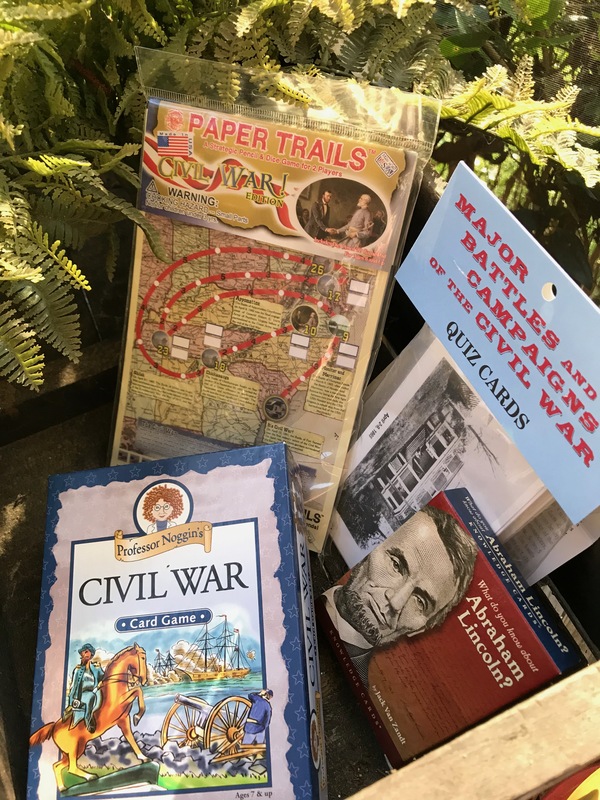 It is a quick and easy way to gain some familiarity with the map and the battles of the civil war. Its another fun lunch time game for two. I love having games and activities like this one at hand because you never know when something is going to happen and you can’t do school today or this week. This is a GREAT project for students to work on with freedom and abandon. I love being able to hand something like this to my kids so they can work on remaking battle fields or creating their own battles. This is also a great resource for projects like dioramas, especially when your student does have the ability to draw all these characters and equipment. Because it is paper you can store the pieces in an envelope instead of a big box. I have a few versions of this resource for different time periods. This resource does take planning and execution on your part, but what a great day you could have in your back yard with a simulation. This is a great way to culminate a unit with a group of friends and their moms to help you pull it off. All you have to do is just follow the directions. You just need to get the material in this book copied and ready for each participant. The hard part of coming up with every aspect of a complicated event like this is done for you. I have every time line that Milliken makes. It is a great way to start each unit and then to refer to it through our unit by displaying the front as we study. The back is not blank it is so full of ideas for teachers: Projects, essays, research options, geography and facts. I love these fold outs. They provide a lot of education in a very little space and easy to use format. This is a great series that I have used on many topics. I love doing projects with my kids, but I don’t love coming up with everything so this is a great book full of ideas. I hope this list will inspire you to study the Civil War more deeply and equips you to get it done. It was a fascinating moment in the making of this nation and we will never forget the trips we took and the books we read together. 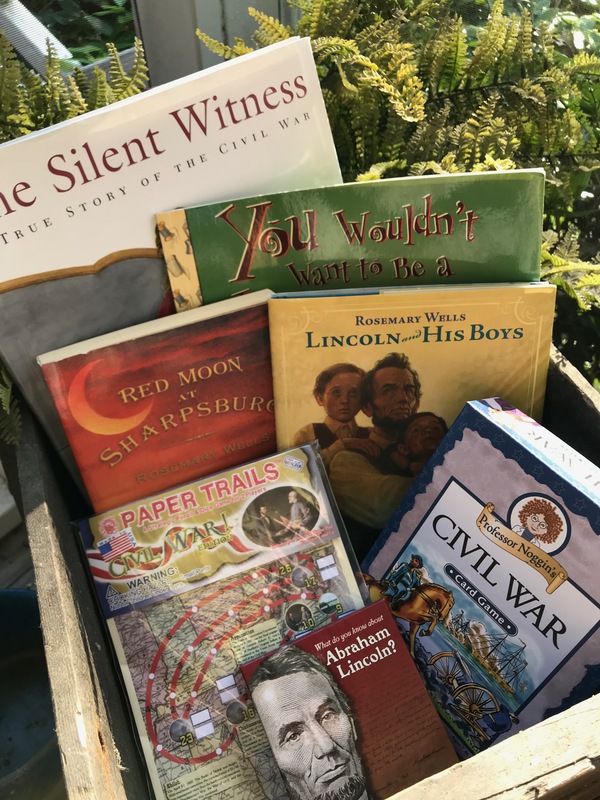 I would love to hear about your favorite resource or field trip in studying the Civil War. Go over to the At Our Family Table facebook page and let us all know your favorite.